Click on the Program Fees for the flat fee cost and payment schedule. Long term exchanges are for an academic year and vary from 10 to 11 ½ months depending on the country. Students depart in the July-September period and return after the end of the academic year. Students accept the rules of the host Rotary Club and the host parents. Students enroll at the school designated by their host club, attend classes regularly and participate in school activities. Students are ambassadors and behave in a manner which will reflect credit on their family, community, country and Rotary. Contact your local Rotary Club and tell them of your interest or send us an email and we’ll let you know who to contact in your area. Download and follow the instructions carefully to complete the forms below and submit these to your local Rotary Club by the date indicated. Local Rotary Club interviews of the Student and parents occur in October, and after approval from that process, complete and submit the remaining forms with the registration fee. Note that some items required with the submission can take additional time to obtain eg birth certificate, school transcript, and (if available) passport. * These forms are fillable, saveable and printable and some information has been completed for you to save time; however, these forms have compatibility issues with Safari browsers (eg on IPADs) so PLEASE USE YOUR PC OR MAC and be sure to use the most current version of Adobe Reader DC (see link below). District level interviews are conducted with student and parents during November. After the District interview you will be advised in writing of whether or not you have been formally accepted as an outbound Rotary Exchange Student. In February you will be notified of your host country assignment. The District Committee attempts to assign each student one of their top three choices but this is not always possible. Your exact destination within the country will not be known until April or May. As soon as it is known you will be contacted by the D5080 Outbound Coordinator and by your host District. As soon as your host country is identified, you will be contacted by Rotary’s travel agent and asked to register online. After your exact destination is known, round trip open return date airline tickets will be purchased and the Visa application process will start. Contact Tzell Travel Group at 800-888-5275 if you need assistance at any time directly from the travel agent. The first weekend in May there is a two day Outbound Orientation at Camp Lutherhaven in Coeur d’Alene, Idaho. Attendance is mandatory for student and at least one parent. 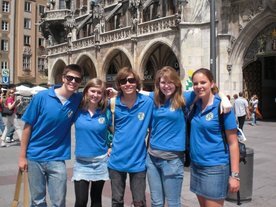 You will have the opportunity to meet the District Youth Exchange Committee members and other key people. Students who wish to receive credit for their school courses need to determine if this is possible with their local school administration before departure. Students must abide by the rules established by Rotary, which can vary from country to country. Host District rules will be provided in writing, for you and your parents to sign and return. Additionally, students must abide by the Rotary International rules, part of the long term application. All forms and applications are opened and saved with FREE Adobe Reader software, please get and install this FREE program if it is not now on your computer. Click on the button to Get Adobe Reader and follow the instructions. Click on the form or application title (underlined) to download and save it. Some of the longer forms (those with an *) are interactive and data can be typed into it and then it can be saved on your computer as you complete it.